Why does everything taste better in a dutch oven? 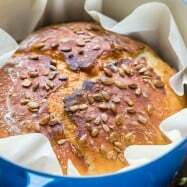 Check out these amazing dutch oven recipes from casseroles, to soups, creamy pasta bakes and even dutch oven bread. 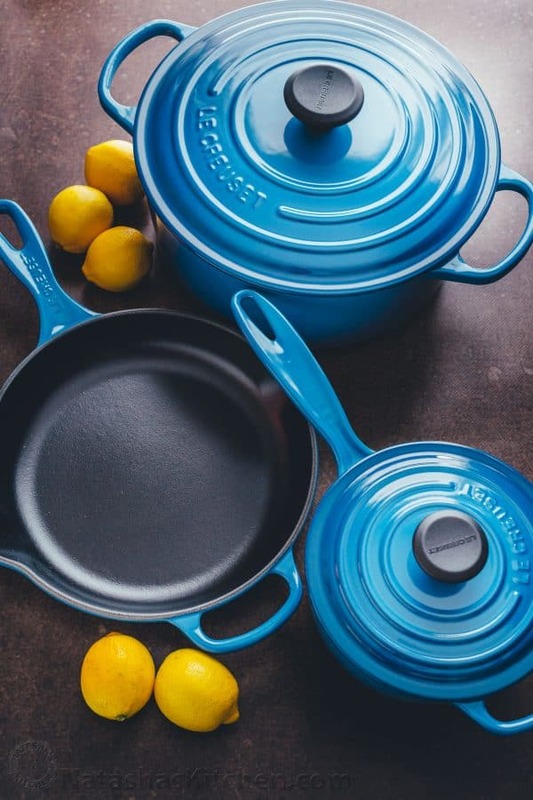 Be sure to check out the fantastic giveaway sponsored by LeCreuset ($675 Value)! 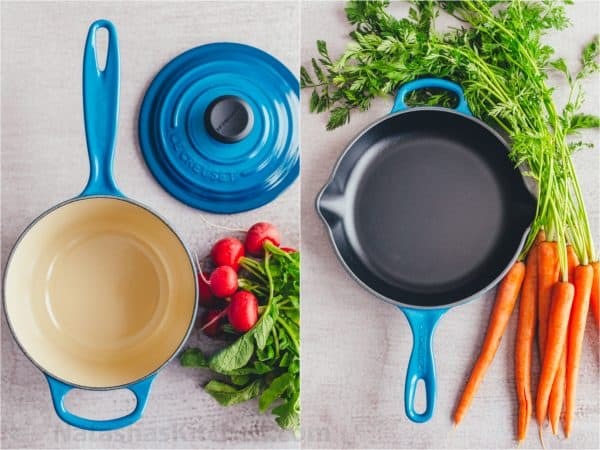 Le Creuset is exceptional in quality and beauty. They are made to use and enjoy for a lifetime. 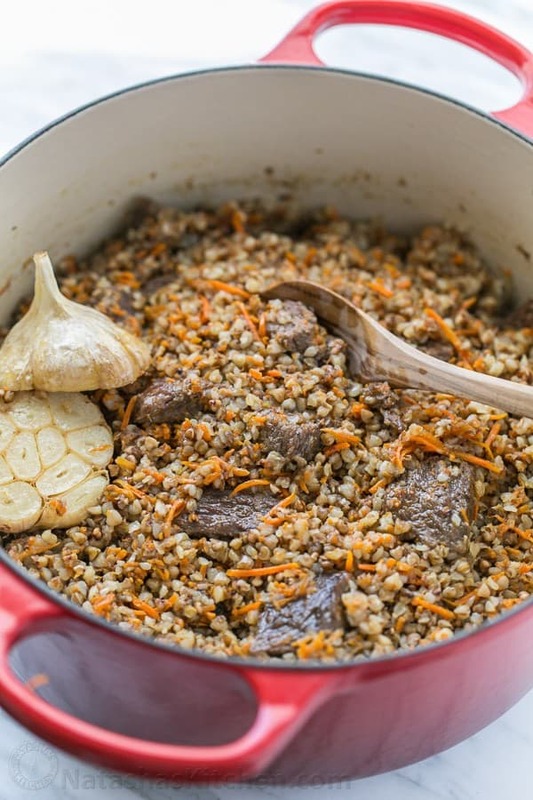 We have found so many great ways to use this LeCreuset dutch oven and some of them will surprise you! Click to see the full list and enter the giveaway! We use this 5.5 Qt Dutch oven by Le Creuset (Amazon affiliate link). We actually have 2 (in Red and Blue). Now all I need is the white one and I can decorate for the 4th of July! 😉 The non-stick coating makes it super easy to clean, cook with and maintain. We’re giving away a fantastic set of LeCreuset cookware including this 5.5 Qt Dutch oven. Enter the giveaway below! Dutch ovens have been around FOR-EVER! The dutch oven is such a versatile tool in the kitchen. It makes everything taste better because they have a heavy bottom for even heat conduction and they have heavy lids that seal in moisture and flavor. This pot is most useful for dutch oven recipes that need to go from the stove to the oven, reducing what we call the “dish factor” (less dishes!). They also retain heat really well and are lovely for serving. 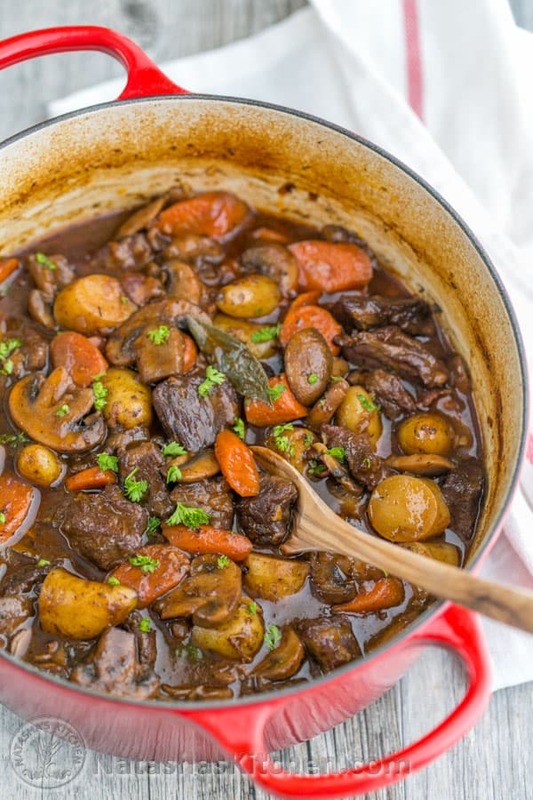 Our dutch oven recipes are among some of the top recipes on our site. 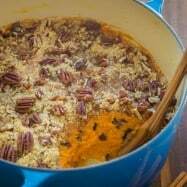 If you’re on the fence about investing in a dutch oven, this post may help you see the vast possibilities for cooking with a dutch oven. 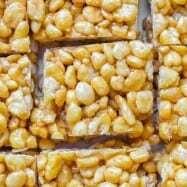 We have everything from dutch oven steel cut oats to a gorgeous pork tenderloin roast for the holidays, to something as simple as cooking shrimp pasta, and even corn pops treats! Sauerkraut Soup – completely delicous with white beans and bacon. 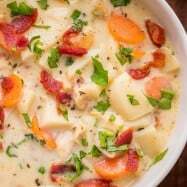 Clam Chowder – New England style with a secret garnish! 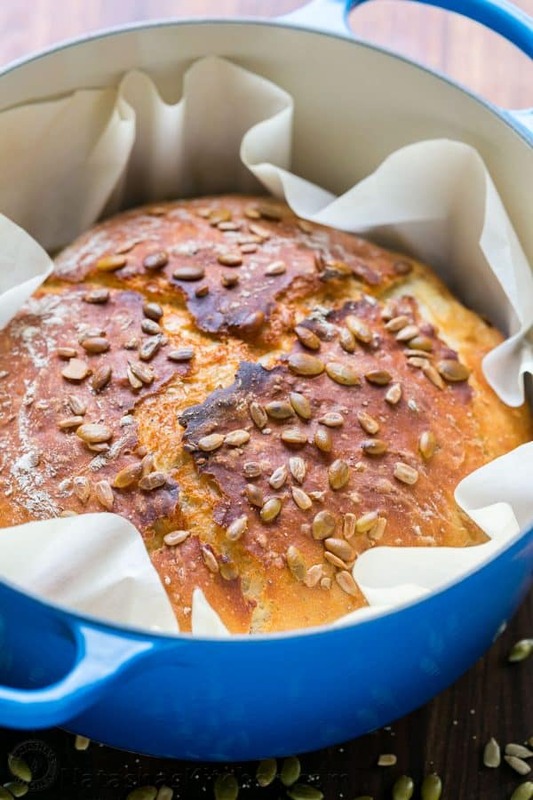 Easy 5-Seed Dutch Oven Bread – crispy outside and so soft inside. How to Cook Beans in a Dutch Oven – homemade is just way better than canned! 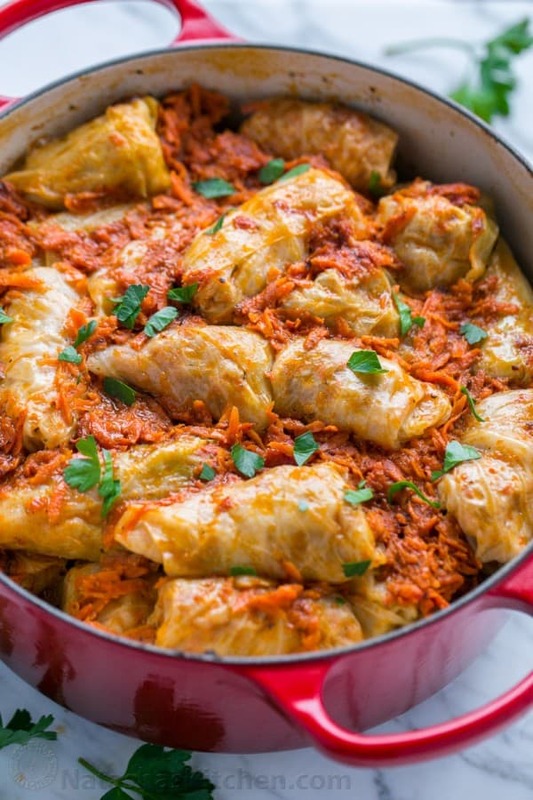 Stuffed Cabbage Rolls – just like Mom’s! These are cooked to perfection in a dutch oven. 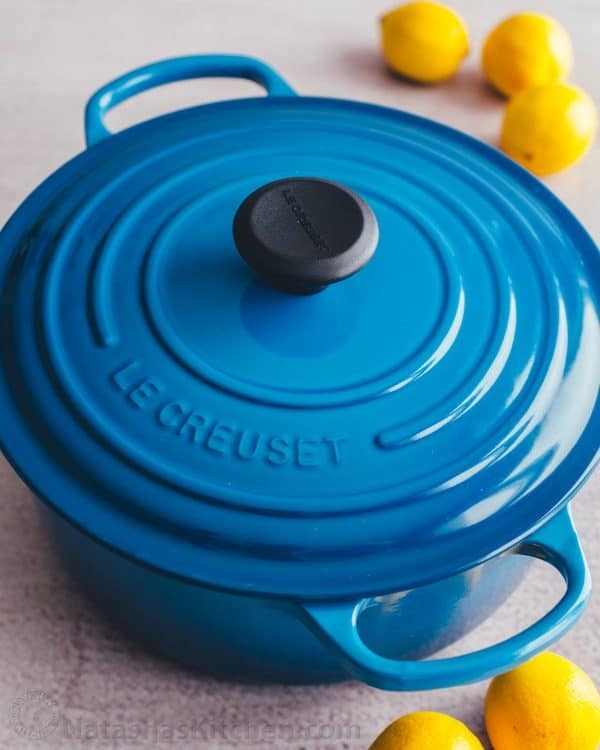 Winner will select their color of choice which is open to colors available on LeCreuset website (cannot accommodate exclusives). 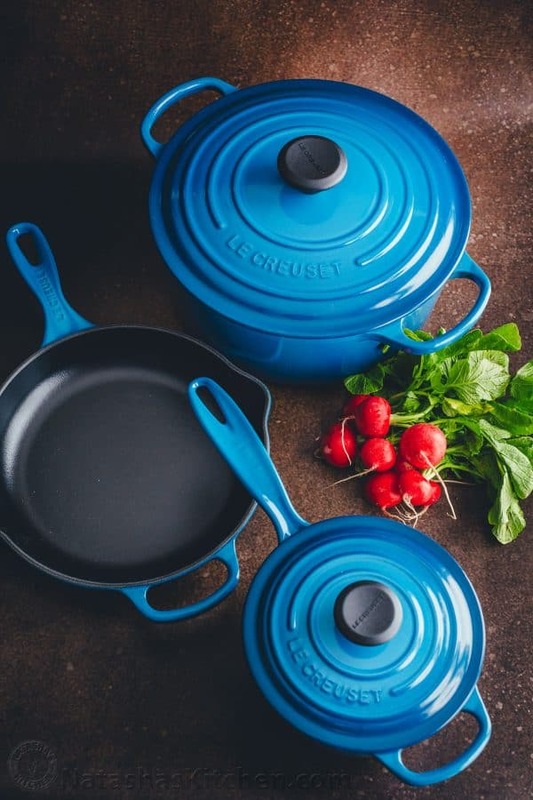 A big thank you to LeCreuset for sponsoring this generous giveaway! Login on Rafflecopter widget below using email links or Facebook. Use one or all giveaway entry options for more chances to win. Click the check box at the right to enter on each entry – a greyed out check mark box on the entries you selected means you’ve entered! If you are having trouble with entering, feel free to answer the question in a comment below. Giveaway ends Sunday May 6th, 2018 at 11:59pm MST. Winner will be randomly selected shortly after. The rules: one entry per person, must have US address, and be 18 years or older. Do yu have any favorite Dutch Oven Recipe? Let me know in a comment below! We just love putting our dutch oven to work! 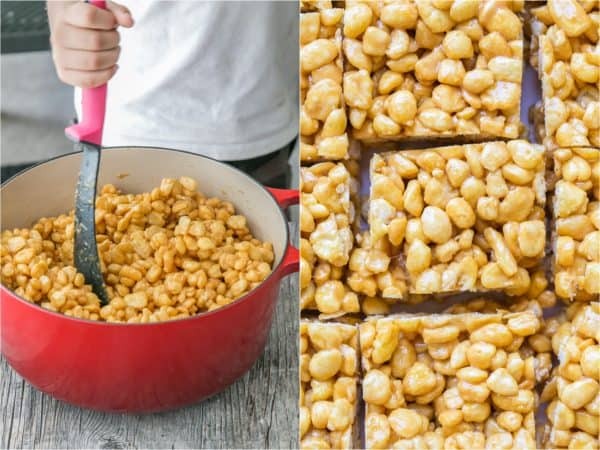 New Weekly Newsletter + Le Creuset Giveaway! Love making my Vegetarian Chili in my large creuset dutch oven. 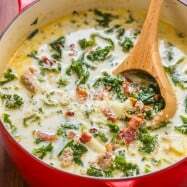 My husband loves my red lentil soup & my son loves my chicken escarole done in this pot too. Hello Natasha, I have the question what I need to do to win this beautiful red dishes, I love it, plz tell me. I make chicken and dumplings in my Lodge dutch oven as well as soups. When we moved the box with the covers for ALL of my pots and Dutch oven did not make it to our new home. So I am making do with a few pots from Walmart. I was trying a few recipes from your website and I’m very happy that I found you on the internet. Your’s recipes are amazing. I do Stuffed Cabbage Rolls all the time and I love it. I never try to do it in this dishes what you have but still, they are so good. Thank you so much for doing this for us all. 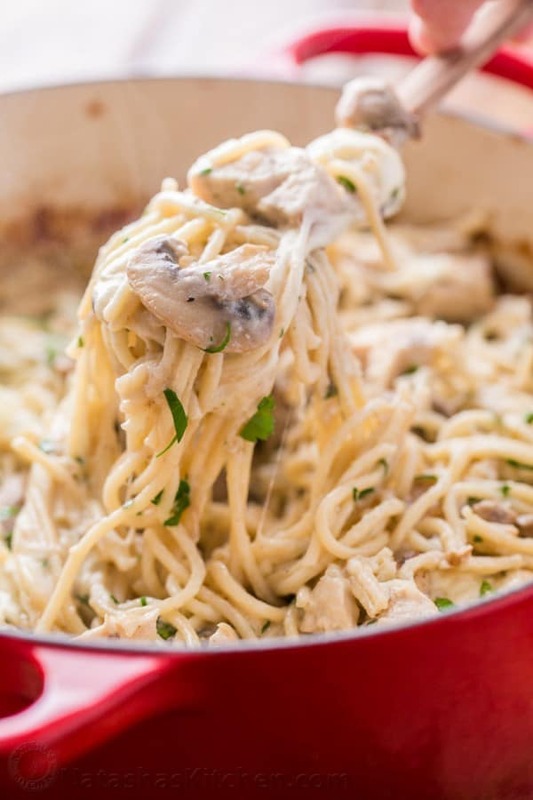 I would most definitely make your Creamy Chicken with Mushrooms and Asparagus. It looks amazing! I do not have one yet but I am sure I will make casseroles and stews for sure. This one looks really good!